More info' on the Creepshow DVD (announced below).... the disc will also feature a commentary by director George A Romero and make-up effects guru Tom Savini. The RRP for Second Sight's Berlin Alexanderplatz DVD box set has been reduced to £54.99 (from £69.99). The set is due for release on October the 22nd. The set will feature more than two hours of bonus features, including a Making of... featurette and a restoration demonstration. The Incoming database continues to be updated regularly. Please visit it, and please use the affiliated links to order your DVDs. Every sale helps support this website! Universal will release a two-disc special edition of George A Romero's horror anthology film Creepshow on October the 22nd, to mark its 25th anniversary. (Note that most of the etailers have the release date as October the 15th, which is apparently incorrect). 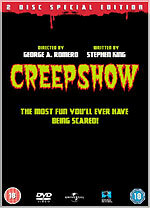 From the origins of the classic “E.C.” comics to the creation of the film’s screenplay, this chapter delves in the historic meeting of George Romero and Stephen King and how Creepshow came to be. A look into the production, design, cinematography, and on-set challenges in creating the comic-ally dynamic visuals of the film. Candid interviews with many of the actors, including Adrienne Barbeau and Ed Harris, and how they created their outrageous characters. An in-depth look at the ghoulish creations of special make-up effects and creature creator Tom Savini. The cast & crew sound off on the difficulties of wrangling over 10,000 cockroaches in the film’s final segment. No technical details were announced. The disc has an RRP of £19.99. The Lord of the Rings Trilogy All-Nighter – all three films showing back to back, with a 30-minute break between each. Screening in 35mm.